The Waupaca Volunteer Fire Department was formed in a meeting on May 11, 1871. George Howlet was elected Foreman; H.C. Mumbrue, Chief Engineer; Willis Wheeler, Foreman of the Hose; Joe H. Woodnorth, First Assistant Foreman; W.A. West, Second Assistant Foreman; Charles Brown, Secretary; David Parish, Treasurer; and G.W. Palmer was to take care of the engine. Uniforms were bought to be worn at meetings and celebrations. The fire department was divided into two divisions. One was the Hook and Ladder Company and the other was the Hose Company. 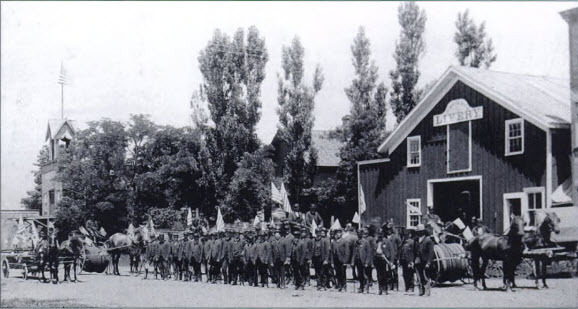 The Firemen’s Band was created in 1878. 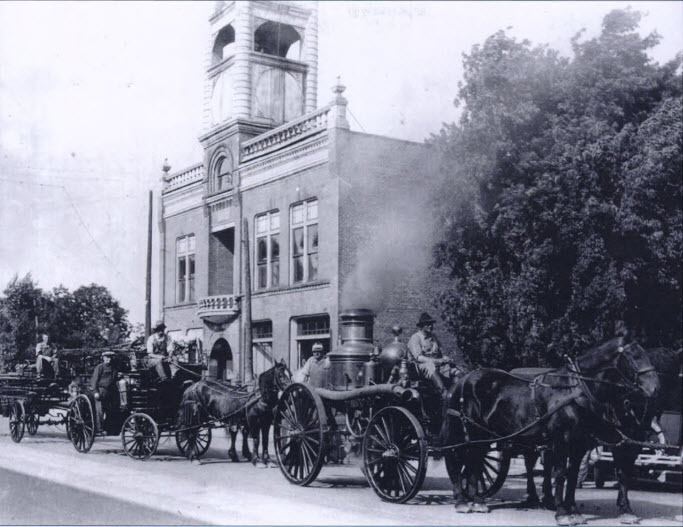 The first horse drawn fire engine, an 1885 Mansfield steam fire engine, was purchased for $770.00. 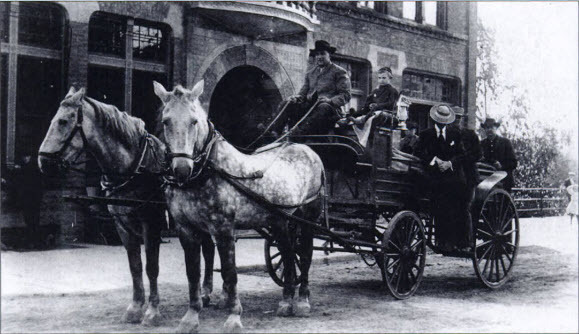 A hose cart and hose was purchased in 1892 for $600.00. Later the Fire Department Committee approved the purchase, from Stevens Point, of a steam driven fire engine at a cost of $1,400. In 1894, the new City Hall / Fire Station was built at 210 N. Main Street (now occupied by the Fireside Apartments). The fire department was assigned the southeast room on the second floor as a meeting room. Two dozen strong chairs and a secretary’s desk were ordered for the departments use. The main floor of the building had stalls for the horses and bays for the fire apparatus. 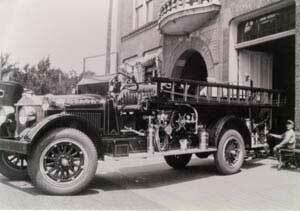 The first gasoline powered fire truck was purchased by the Waupaca Fire Company in 1926 from W.S. Nott Company of Minneapolis, MN for $5,000. The City Council passed an ordinance in 1939 combining the Hook and Ladder Company and the Hose Company into one group, which became the Waupaca Fire Department. On July 7, 1942, the City of Waupaca purchased a used Seagrave fire truck from the City of Shawano. This gave the Waupaca Fire Department two motorized units. The townships of Farmington and Waupaca purchased a new Mack fire truck in 1944 and entered into an agreement with the City of Waupaca to house, care for, and man the fire truck for the townshi ps’ fire protection. On October 31, 1950 the City of Waupaca purchased a new four wheel drive fire truck from the Four Wheel Drive (FWD) Company in Clintonville. Until the early 1960’s only three fire engines protected the City. Time took its toll on the building which housed the fire department and city hall. New larger and heavier equipment could no longer be housed in the station. A new building had to be constructed to replace the over 70 year old landmark. In 1968 the fire department moved into their new quarters located next to the old Waupaca Armory. A hose tower was built to aid in drying hoses. More room was needed to accommodate additional fire engines and equipment, and in 1979 the members of the Waupaca Volunteer Fire Department built a five stall addition to the existing building. Now, 147 years later, the Waupaca Fire Department is still going strong. Many changes have taken place over the years. Our coverage area has increased from just the village of Waupaca in the early 1860’s, to approximately 150 square miles. It includes the townships of Waupaca, Farmington, Dayton, and parts of Lind, in addition to the City of Waupaca. In 1991, this group of townships and the City of Waupaca united to form what is now known as the Waupaca Area Fire District.